Last week, the Public Religion Research Institute (PRRI) released “America’s Changing Religious Identity” a report based on an aggregation of surveys of 101,000 Americans conducted during 2016. The headlines, plastered across news outlets such as The Atlantic, USA Today, and The Religion News Service, were that religion was on the decline. An op-ed by PRRI’s CEO Robert P. Jones in USA Today was more blunt, targeting white evangelicals and describing them as a “dying patient,” “fading,” and at the “end-of-life” after finding that they had declined six percentage points (23%-17%) in a decade (2006-2016). There is just one big problem: other prominent, longitudinal surveys do not corroborate the decline among evangelicals. The framing of the USA Today op-ed overly sensationalized and perhaps mischaracterized the drop in evangelicals. Certainly evangelicals’ cultural power has been changing, as one of us has thoroughly documented in a new book, but they are not on their deathbed. Then Tobin Grant of Southern Illinois University, Carbondale tweeted data from the General Social Survey (GSS) showing virtually no change in white born-again self-identifiers over the past decade. We decided to probe further. The best longitudinal surveys to compare PRRI’s results are the GSS and the Cooperative Congressional Election Study (CCES). Both have the advantage of being large, national samples, and both include two different approaches to measuring evangelicals – affiliation with specific denominations and self-identification with evangelicalism (which PRRI used). There is some scholarly debate about which evangelical measure is best, so we thought it was helpful to include both. In either approach to categorizing evangelicals, we limited our evangelical category to white Protestants, which is common practice. Essentially, comparing the GSS and CCES data with the PRRI results using both measurement strategies allows us to fully assess if there is decline. The GSS and CCES also allow us to look at two different survey methods, as the GSS is conducted face-to-face, while the CCES is conducted online. The figure below shows the percentage of evangelicals by affiliation and self-identification for both the CCES (2008-2016) and the GSS (2006-2016). The clear finding is that there are only slight differences in the estimates of the evangelical population, no matter how you classify them, over the ten-year period. There is no evidence of a 6 percentage point drop. In the GSS, the percentage of evangelicals by affiliation declines slightly (2-3%), but evangelicals by self-identification (the approach PRRI used) remain constant. 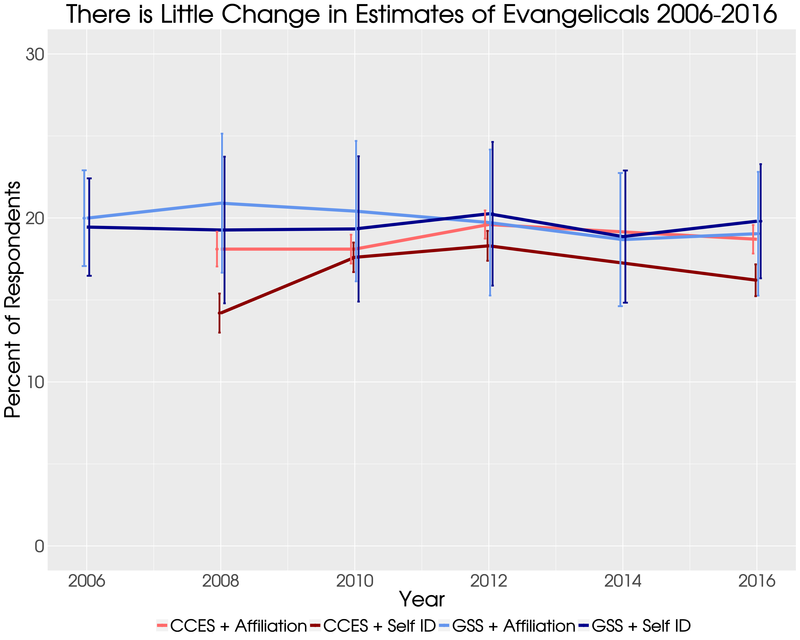 In the CCES, evangelicals by self-identification actually increase from the 2008 baseline, while evangelicals by affiliation remain relatively constant. In fact, the only statistically significant change in all the data is an increase in self-identified evangelicals in the CCES from 2008 to 2012 (and nearly 2016). So where is PRRI’s data perhaps mistaken? PRRI is accurately capturing the percentage of evangelicals in 2016. PRRI pegs evangelicals at 17%, while the GSS has them between 18-19% and CCES has them between 16-18%. The problem, however, is that PRRI seems to have had an inflated percentage of evangelicals in 2006 compared to other surveys. (In the pre-2010 period, PRRI is actually drawing upon Pew reports.) PRRI’s reported number in 2006 was 23%, while the GSS was about 19-20% and the CCES was between 14-18% (in 2008). The comparison of the PRRI percentage of self-identified evangelicals with similar approaches in the GSS and CCES are shown below, visually displaying that PRRI’s data (the blue line) went from being on the high end of the range to the low end, yielding a higher gap than the other surveys. On average, the other surveys show consistency. In fact, both the GSS and CCES provide some evidence that self-identified white evangelicals have increased in the past decade. Bringing data from the GSS and CCES together with the PRRI data should provide a strong dose of caution to stories about evangelical decline over the past decade, and especially evangelicals being on their deathbed. Now white evangelicals do appear to have declined about 10 percentage points since their peak in the 1980s, as the figure below from the GSS shows (using the affiliation classification scheme). The decline, however, seems to have been realized between the mid-1990s and mid-2000s, largely leveling out in the present era. Thus, while there are some signs that white evangelicalism has continued to be in a slight decline over the past decade, it does not appear to be in a freefall. While evangelicals do not appear to be knocking on death’s door, they have entered into a new cultural era, one marked by a minority cultural position. In fact, while evangelicals’ numbers are staying relatively consistent, the decline in white America and broader Christian America are likely to place them in the cultural minority. As one of us has examined at length, such a cultural change has broad political implications, particularly for the politics of rights and legal advocacy, helping explain the power of the religious liberty campaign. Andrew R. Lewis is an Assistant Professor at the University of Cincinnati. He is the author of The Rights Turn in Conservative Christian Politics: How Abortion Transformed the Culture Wars (Cambridge, 2017). You can follow him on Twitter and see more of his research on his personal website. A figure with the confidence intervals is available here: https://raw.githubusercontent.com/ryanburge/measuring_evangelicals/master/rip_line_with_ci.png.